After processing soil samples for two weeks (341 to be exact!) I was able to analyze some of the results and, along with the trusty functions of R (and of course T-Swift music) graph my data. I have included my poster down below and a pdf link. The results provide evidence that shows soil in western Minnesota contains large percentages of sand and silt, with little clay. Between each of the 8 locations, some variation was present in the amount of sand, but not with clay. 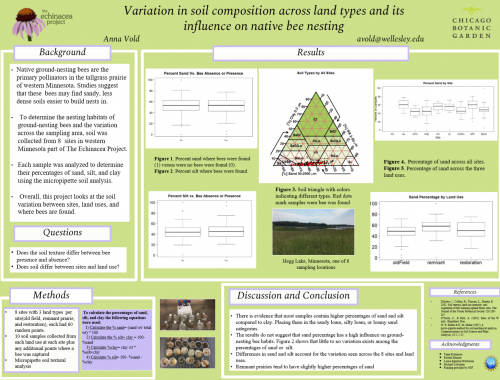 The results also showed that sand and silt may have no influence on the nesting locations of native bees. When compared, the graphs of sand and silt percentages from where a bee was found and not found were quite similar. So the question remains- What are the factors that influence where bees build their nests? Throughout my entire time working on Team Echinacea and this soil project, I have gained valuable knowledge and experience about data collection, project development, and different research methods. And not to mention the amazing lab group and individuals I have gotten to work/collaborate with! Since my college career is just beginning, the future has a lot in store for me- I can’t wait to see what happens in the next couple of years. But one thing is for sure, I can officially cross “eat deep dish pizza in Chicago” off my bucket list!